For a moment, Ahmed Naas thought his life would change — he overcame the odds to not just qualify for the Paralympics, but briefly held a world record, and was eventually awarded a silver medal. He dreamed of fame in his native Iraq, adulation from his friends and compatriots, and a chance to secure his family’s future. He was, after all, a champion, in his words. A hero. “I thought I would be a king of sport in Iraq. I thought I would live like a king, that I would be a symbol for Iraq,” the 20-year-old said in his hometown of Batha, in Dhi Qar province south of Baghdad. Despite combined prize money from various Iraqi government sources of around $33,000 (26,000 euros), which he has used to purchase a small plot of land in Batha, Naas is back to work at his family’s grocery stall, is again training in spartan conditions, and living with his extended family. Naas’s frustration is common among athletes in Iraq, where few resources are dedicated to sports aside from football. The national team dominates local attention, and funds are focused on sporting facilities in Baghdad. Naas, who suffers from dwarfism, won over massive crowds at London’s Olympic stadium when, after hurling his javelin 43.27 metres and setting a world record in the F40 category, he performed a string of cartwheels in jubilation before passionately pumping his fist into the air. He was eventually beaten by China’s Wang Zhiming, who shattered Naas’s record to claim the gold medal. The result, though disappointing, remained impressive considering Naas only took up the javelin full-time earlier this year, and indeed had stopped training completely for a year in 2009 when one coach told him he lacked the athleticism to compete. But after strong showings earlier this year in local competitions, he managed to make the Paralympic team, embarking on training camps in Baghdad, northern Iraq and Turkey. His medal was a rare bright spot for Iraq in the Olympics and Paralympics. Iraq has won just one bronze medal over its decades of participation in the Olympics, and has a total of eight medals in the Paralympics, including its haul in London of two silvers and a bronze. Returning home a medal-winner, however, Naas found little of his daily life changed — he still lives with his father, seven brothers and extended family in a small one-storey house. Nearby, children play in open plots of land strewn with trash and open sewers pass in front of the houses in the neighbourhood, many of which bear posters of prominent figures of Shiite Islam. He still trudges to the family’s vegetable stall five days a week, where he works five hours a day, scraping together between $15 and $25 a day between him and three brothers. To make matters worse, he notes that nearby stall-owners tease him — a silver medallist at the Paralympics, back to his hand-to-mouth existence selling vegetables at his family’s stand in their tiny hometown. “I find it very hard to deal with the fact that, after all my achievements, I had to go back to my old job,” Naas said, wiping away tears between sentences. “I was very proud of myself. I feel like I deserve better than going back to the same work. His reception stands in marked contrast to that of successful athletes representing the Paralympics’ host nation, Britain — gold medallists were all honoured with commemorative stamps, and shared in a prize fund. Silver and bronze medallists, meanwhile, received heroes’ welcomes in their hometowns, with many appearing on television and awards shows. And despite relative Paralympic success, Naas’s training regimen remains extremely rudimentary, consisting of alternating days of workouts, if they can be called that. Lacking the money for exercise equipment or access to a gym, Naas works out on the roof of his family’s home with a small weighted ball gifted to him by a coach and a barbell he has fashioned out of an empty metal pipe connected to two metal cannisters filled with cement. He has no idea how much the barbell weighs but completes multiple sets of lifts before attempting to throw the ball the length of the roof, which is covered in dust and bears only a small satellite dish and some plastic crates. Naas then walks for around half an hour, even in Iraq’s boiling summer, yo what he calls a training ground, but which is in reality a tract of dirt between a railway track and a main road. There, he hurls his javelin — also a gift — as far as he can, with one of his brothers helping him retrieve it. 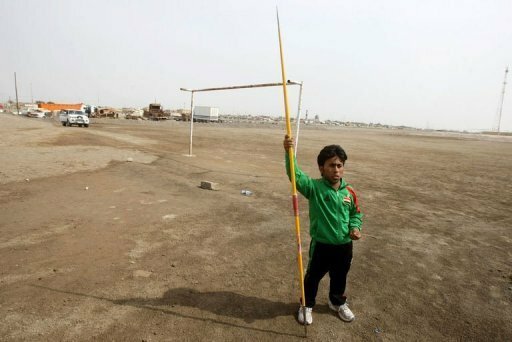 Lacking any detailed measuring devices, he lays the javelin, which he estimated to be around two metres (6.6 feet) in length, along the ground to gauge how far it has travelled. “I go to my family’s stall to be a grocer, to sell fruit and vegetables,” Naas said. “And then I go back home, to train on my roof, and then come here to train. Does this suit a champion? No. Naas recalled how, despite the lack of any reception in Baghdad, his relatives and friends in Batha greeted him with three days of celebrations, with people from around the town visiting to congratulate him.